I think the name of these blondies says it all. As soon as I see the words brown butter, I know I'm getting into something good. When that brown butter is in blondies, it gets even better. When you add Magners Irish Cider to those blondies, the only thing you'll ask yourself is why didn't I try this sooner?! It's no secret that I have a thing for blondies, so it's been in my head for a while to make some fit for Saint Patrick's Day. 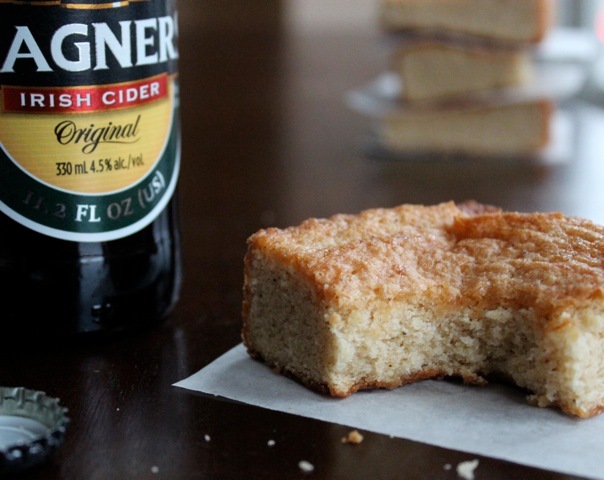 Using Magners was a clear choice for me because it's one of my favorite drinks, and in my opinion I think a little booze in blondies is a very good thing. In case you're not familiar with Magners, it's an alcoholic cider made from apples. The best way I can describe the taste is by saying it has a mild sweetness from the apples, and has a bite to it that balances it perfectly. When I started putting the recipe together, I knew brown butter would enhance the flavor of the cider beautifully. I adapted my go to blondie recipe and the final result turned out awesome! This is definitely a recipe I will make again and again. After a few test runs I ended up using a half cup of cider in the recipe which works out great because you have some for the blondies and some for you! The cider makes these blondies a bit lighter than a typical blondie, and cuts the sweetness nicely. I love the beautiful golden color they get on top, and those little specks of brown butter you see, well, I call that love! Hope you enjoy them! Alternate adding dries with Magners. Line a 9" x 13" pan with parchment, spray with non stick spray, and fill with batter. Pics are great and the last picture killed me, I want a bite too! I have never had Magner's but I do love cider, so I will have to search this one out and then make your delicious looking blondies. What a great recipe. I love blondies and this is so creative! This Magners will be a rare find, but I already have plans for a visit to the liquor store tomorrow. This will be on the list because I want to taste the flavor of these. Your picture does reveal a wonderful texture too. Another keeper-thanks! Thanks Tina! Hope you were able to find it! You can get it at Harris Teeters!!! Oh these looks so delicious, the specks of brown butter and the golden crust... great recipe. I love blondies, they are becoming my new obsession. This looks like an amazing version! What a great recipe! Blondies are a great dessert. Magners is a new to me ingredient and something I would like to try. Your photography makes these crave worthy! Looks so delicious. Some for the blondies and some for you! I like the way you think! Thanks Jaime! Hope you enjoy them! Seriously loving the brown butter desserts! I think I'm digging blondies more than brownies & if you add the booze you've definitely won me over! These sound and look fantastic!! Thanks Lacy! You can't go wrong with brown butter & booze! YUM! Browned butter is the bestest! Cider blondies? GENIUS! I would adore these little gems :) Well done! I've never heard of Magner's but I'm sure interested. These look like I'd be having more than one. Thanks Mike! That is interesting, never heard of Bulmers! Wow these sound terrific. I'll have to amend my shopping list that I just finished. Meghan, how did you know I'm DYING to learn to make a great blonde brownie (just so I can eat it)? I dare anyone to take my cc cookie or chocolate brownie crown. I dare them. But blonde = no one home. Thank you for this post! Magner's here I come. Ha, thanks Cindy! Hope you like them! Yum, yum, yum! Magners must give it an extra special kick. Happy St. Patrick's Day. These will be the hit of the celebrations. Oh my goodness these look yummy. Beer and butter, you're like an evil genius or something. Congrats on top 9! Congrats for the Foodbuzz Top9!! I was sure that I would love this recipe of yours too. I have to find vanilla paste though. In Cyprus I never came across this ingredient before. Thank you! You can substitute vanilla extract for the vanilla bean paste. Very fond of Magners, particularly on a rare Irish summer's day. I can see it really working well with these gorgeous blondies - definitely making these! Yes, perfect summer drink! In a pint glass no ice! Congratulations for making Top 9 on Foodbuzz today! I've never had a Magner before not sure if we have it in Melbourne hehe but these look and sound fantastic thanks for sharing! Thank you Amalia! Hope you had a great weekend! Wow, these definitely look and sound delicious. Congrats on the Top 9. I love blondies too! And the twist with the Magners is awesome! Perfect for Saint Paddy's Day! Wow this looks so moist & flavorful... fabulous job! Mmmmmm...these sound perfectly wonderful! Isn't brown butter fabulous?? Yum!! These blondies look perfect! Oh I LOVE Magners. My favorite brand of cider. I normally only buy it for St. Patrick's Day. It's hard to find where I live. I might have to part with a bottle just so I can try these blondies. They look amazing. Thanks Carrie! I promise you'll be glad you parted with some! I've never had Magners before, but these look delicious! These Blondies sound and look amazing, especially with the Magner's, cider and browned butter. I can't wait to make these. congrats on the top 9 3-11. I'm behind reading my posts! Thanks girl, it is a lovely combo! I must make these wonders for St.Patrick's Day!...I have a great difficulty finding Vanilla paste here in France...can I possibly make my own? I have vanilla beans, vanilla sugar and vanilla extract...but, alas, no paste! Thank you for any enlightenment! Hi Donna! The paste is just a personal preference of mine, but you can definitely substitute vanilla extract. Hope you enjoy them! When you write "1t. baking powder" you mean teaspoon? Love this recipe and I cannot wait to try it. Bulmers is a personal favorite of mine! Yes, the recipe calls for 1 teaspoon of baking powder. Hope you enjoy them! Brown butter and Magners, wow what a combination...these look scrumptious! Made these this weekend...SO GOOD! Light and you get that just a hint of with the Magner's. For a little extra, I gave it a Magner's Drizzle - a slightly heaping 1/4 c. of powdered sugar and enough Magner's to get it to a consistency that it will "dry" once drizzled. Awesome! So happy you liked them & great idea with the Magners drizzle!